Notwen Oils tins, oil pourers and cans. Homepage. 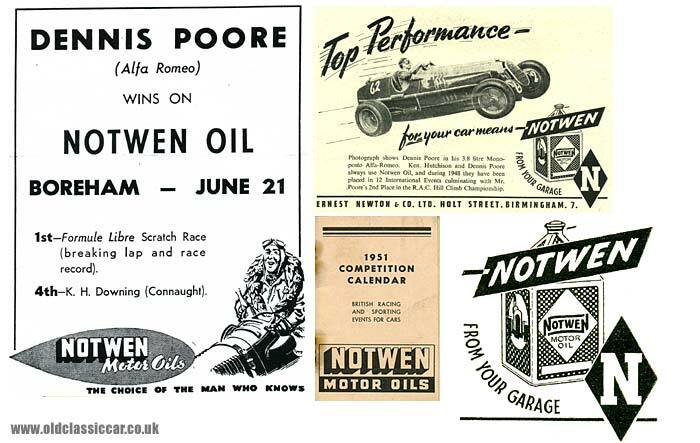 This page: A selection of collectables relating to Birmingham lubricant company Notwen Motor Oils. This page will feature automobilia relating to Ernest Newton's "Notwen Motor Oils" concern, of Aston Cross, Birmingham. A supplier of specialist lubricants for many years, in 1954 it was renamed Newton Motor Oils, before later being taken over by Morris Lubricants of Shrewsbury. The Notwen period is of main interest to me though, and over the last few years I've accumulated a selection of oil pourers, oil cans, tins, and other memorabilia that relates to this oil company. As new items turn up, I'll add them in here. 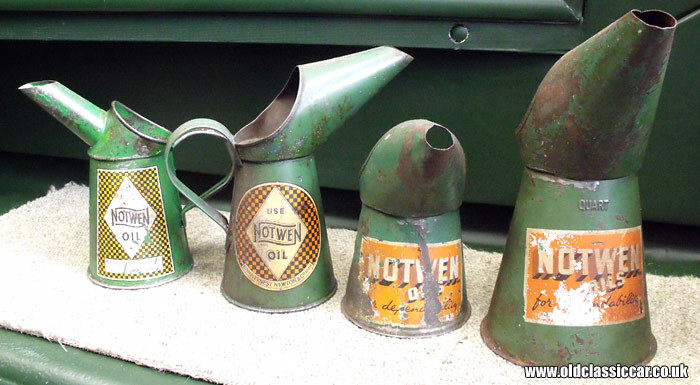 No item of Notwen Oil memorabilia is particularly common, but of the items that do turn up, the most popular are without doubt the various oil pourers that they produced. The earlier oil cans and pourers feature a checkerboard background, while items produced just a few years before the rename to Newton Oils took place, tend to feature a plain orange backdrop. Shown below are the oil cans that I've located so far, the largest being the 1 Quart pourer shown on the righthand side. Notwen notepad and other printed material. The first of the two printed items shown below dates to 1952. Printed on single piece of card and folded in three, it contains a distance table of major towns and cities from Birmingham. 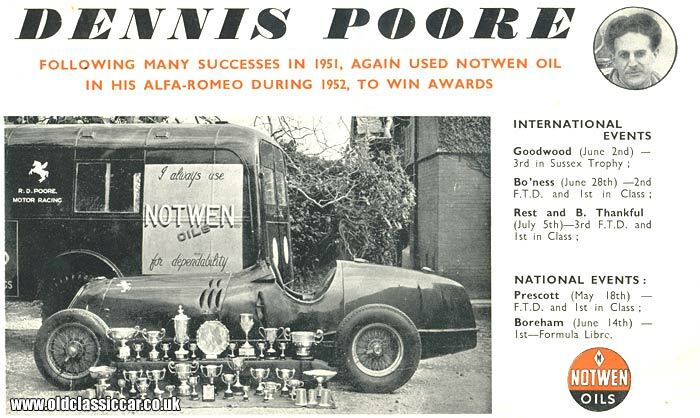 A note within the pages of this item highlights their involvement with the supply of oils to racing teams and drivers, listing some of the successes achieved by drivers using Notwen Oil in 1951. These include the RAC Trials Championship, the Circuit of Ireland Trial, Sports Car Records at Silverstone and Ibsley, along with the B.T.D.A. Star. A photo of my old truck incorporated within an advertisement from 1952/1953 is shown below, and features Notwen livery on it. The advert appears elsewhere on the site, but is repeated here. Writing material featuring the Notwen branding. Ernest Newton's company was a prolific producer of promotional items in the early 1950s. The following three items turned up together in 2011. The orange pencil includes the slogan "NOTWEN MOTOR OILS - as good as the Best - costs less than the rest! ", while the rubber eraser simply bears the company's name on it. Shown with both these items is a neat propelling pencil. In addition to promoting the brand, and the Ernest Newton & Co. name, it also makes reference to "Soaps, Polishes and Swabs" and "Distilled Water". A pre-war postcard featuring a Rolls-Royce used on Notwen business, can be seen on this page, while a Newton Motor Oils matchbook can be found here. Five-gallon Notwen Motor Oils can. 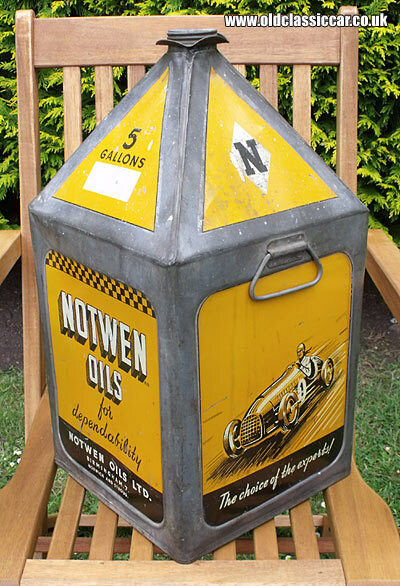 My favourite item though, and one which I've had my eye open for over recent years, is this 5 gallon oil can bearing the legend "Notwen Oils - For Dependability". Finished in orange, three sides feature the company name, with the fourth containing an illustration of a driver behind the wheel of his racing car. It's interesting to note that while the colour orange is consistently used throughout their promotional activities, the actual shade differs greatly between the different items, even after allowing for some fading over the years. Some also refer to OIL (singular), while other items refer to OILS (plural). Some old advertisements for this brand of motor lubricant feature elsewhere, but are reproduced here again. It goes without saying that I'd be interested to hear about any other Notwen-related items for sale out there, whether similar to those shown above, or different. I'd particularly like to find a 5-gallon Notwen tin that features the checkerboard background. 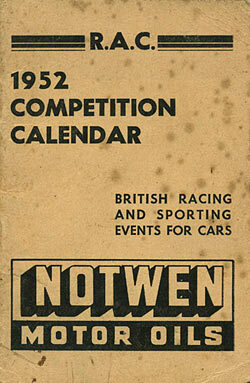 Competition calendars for 1951 and 1952. Both of these calendars measure approximately 7cm x 10cm and list the main competition events for the coming year. International meetings, such as the Monte Carlo Rally, feature alongside club events closer to home, such as the Grimsby M.C. Night Trial, and Caernarvonshire & Anglesey Speed Trial. More period items relating to old vehicles can be found in the Motoring Collectables section of oldclassiccar.co.uk. A broader selection of memorabilia similar to those featured above can be found on the petrol & oil company memorabilia page.